Who hunts with a 40 pound bow and what spine arrows and broad head combinations are you guys running? 44 @28 Big Jim's Thunderchild,Beman 500 spine Centershot arrows and 200 grain Cutthroat broadheads. 40# longbow, 30” 500 spine, 200gr Grizzlies with glue in inserts =240gr. For 3D I use 600 spine with 175gr tips. I hunt with one of three 40# long bows. One is a Steve Turray Baraga and the other two are selfbows. The arrows are wood and spined for the bows with stone points. 43# @ 29, Border Covert Hunter Hex 8, 30" 340 spine with standard inserts and 150 grain Magnus Stingers. 42# howatt bandido 400 beman ics hunters with 150gr. bodkin broadhead.450 gr arrow weight.Selfbow. my own built bow and arrows. What do you use Frank? Their must be a reason you asked.As you can see above it all varies for each of us. End results is what counts. 42# with Gold Tip 600 29" 50 grain insert and 145 grain Razorhead.Setup has a little more than 11 grains per pound and not the most impressive Kinetic energy rating of about 30 pounds. 40# ILF, Gold Tip Trad 500s 30.5", Grizzly heads on steel inserts for just over 200gr up front. Quiet, comfortable, fun to shoot. 41# GT 15-35 30" with 220 GT up front. While I haven't hunted with it yet this season, I've been shooting my Bear T/D 43 lbs. at my 30 inch draw. Shooting 2016 XX75's cut to 30.5 inches and using 150 grain broadheads. 40 pound Savannah, 44 pound Great Plains longbow, 46 pound 1952 Bear Grizzly and a 38 pound Robertson longbow. 45lb 62 inch TimberHawk longbow. G.T. 15/35s 100grn brass inserts and 175 Ace broadheads. 42# Toelke Whip 62". I draw 26.5". When I originally got this bow it required very weak arrows---I was shooting 700s. The longer I had it the stiffer the arrow that it needed---my form was developing and once I had achieved proper back tension and a dynamic release I ended up with 500 spine Black Eagle Vintage arrows with 150 grain grizzly single bevels up front for a total weight of around 500 grains. I like the 34" arrow as it allows me to use a very short crawl to get the point on that I want. My other rig is a 40@29" PIKA and I have it very well tuned with the Black Eagle 600s and 125 stingers for a total of 480 grains. I know these spines seem stiff for the these bows---BUT that 34" inch length makes quite a difference. My wife uses 27" bop 1816s with Grizzlies out of her 40 pound bow. Wood with zwickau out of her 38@26 bows. 42 lb 64 Kodiak with 2016 alu,and 160 gr. zwicky,s. Likes heavy arrows.40lb. blackhawk short bee 500 ics with 140gr. bear broadhead arrow uncut 30 inches, but i like to tinker. I’m jumping in just to say that I’m surprised at how many of the guys are shooting carbons at 500 or stiffer with these lighter draw weights; I’ve done quite a bit of bare-shafting with my Recurves and a longbow all rated #55@28” and with a high-performance LB rated #50@28”; and with my +/-27” draw, a full-length 500 is just too stiff, even with some added weight and 150 grains up front. Which matters to the OP here only insofar as to say that it doesn’t matter what arrows other people are shooting, because each bow/shooter combo is something of a law unto itself. And improper spine is hell on penetration, which becmes more important as draw weight goes down, so you really do need to get it as close as you can. Sorry. What was the real question in the OP? Or maybe B) “What arrow should I choose for my #40 bow, because I’m thinking about hunting with it this year?” Or maybe C) Just chewing the fat around the fire...? Answers, by the way, are A) Yes, as long as you don’t screw up B) Nobody can steer you right without more information, and C) OK, cool... what are YOU using/thinking about using/wildly successful with? You can tune the bow to the arrow to a certain extent also.Brace lower, brace higher,nock lower ,nock higher ,strike plate in, strike plate out.Then work with point weight , and arrow length.42 # bow shooting un cut 400 arrow with a 150gr head seems really stiff, but mine is tuned to shoot them like rockets, and bare shaft hits right with field point arrow.The FOC is still good enough.MOst of us would like to shoot the same arrow out of different bows, but some times it does not work out that way for what ever reason.I shoot 2040 predators out of a 35 lb Samick Sage for 3d, and 20 yd. indoor shoots with a 100 gr head ,and had to cut the arrow 28.5 inches, but got it close by tuning with Berger button and flipper and nock and brace.Just have to play with them. I shoot a 1969 Bear Super Mag 45lb@28” (my draw is 26”). 600 spine GT Trad and 125gr Magnus Stinger. This deer was 12 yds from my ladder stand angled down and out through heart. Awesome exit wound.....deer still went 40yds before going down. My daughter’s little deer finder took off when I walked back to get the 4 wheeler (150yds from the house)....when I got back out there to get the deer, she was sitting beside it. 40# Morrison with Max 5 super curve limbs. 29 1\2 Easton Legacy's 2016. A Magnus 2 blade 145 gr, head. My draw length is 28". If it makes you feel any better, I know a guy who has shot (by actual count) THOUSANDS of deer with a variety of cartridges (but mostly .270 Win 150s loaded at 2800 fps), and he fully expects an 80-yard dash from a solid double- lung and 100-120 on a heart-shot. I centerpunched a doe with a 300-grain flying ashtray HP from my .45/70 and she went a good 40... in a circle, as it turned out, but she did stay on her feet for a bit. Anyway, if the arrow put him down quicker than you should probably expect from a great shot with a .270, you done good. Maddog Prairie Predator. 62", 40#@28". I pull 28.5". Using Black Eagle Vintage .500 shafts cut 29.5"b.o.p. with 135gr Zwickey Eskilites. I call her the "Goblin"
Glass bows: Have Wings, Cravotta’s , Staghorn’s, Bears, Pearsons, Stotlers all in 40-47lb range which will shoot 2212-2114’s, carbons 600-500’s or Cedars spined and matched with a good 2 blade. These are effective deer sized killers. When you jump to Elk, Boo, Moose, Bear like a faster setup with minimum of 47-48lbs at my 29.5 DL. As with any hunting knowing where your setup arrows start to really drop hard, that angle of penetration can not be highlighted enough. Thats where the higher % kill shots go the other way or negative return. With these modern bows in 40’s with 400-500grn arrow setup like to shoot 30 and under. not going to hunt with it but I have a dual shelf 59 kodiak I want to start learning to shoot lefty with. I want to shoot carbon with it for the durability over POC, but not sure whether to go with .600 or .700. For POC i'd just get 5/16ths 40-45 cut to 28.5 bop and be done. With these pencil thin carbons I'm lost. Bow pulls about 41lbs at my draw and I'd want the shafts cut 28.5" - 29". Would want to use 125gr field points or 135gr judo's. Haven't used carbons anywhere near this light. Don't really want to get into the heavy point loading unless its necessary to get total arrow weight to or above 8gpp. I'm thinking .600 should be OK, but maybe a bit too stiff cut to 28.5 or so? 150 CE Heritage 28 1/2 long, 165 BH zwickeys, 40@28 bear warfs, Uuka limbs, 20 strand X strings. Never hunted 150 Sam but i have a bunch. They have pins in back though. Both my set ups are 40.5# and 41# at my 29” draw. I am shooting CE Maxima Blue 150 (500 spine) with150 grain Magnus Stingers up front and a small footing. Length of arrow 30.5” Both bows shooting 180-186 FPS. This will be the first year I am hunting with such a light set up. I have no doubt it will get it done on deer,turkey,black bear and small game. Fortunately, Lancaster sells shafts in whatever quantity you need, so a test kit is an easy thing to assemble. Its an Alaskan, not Kodial btw. Bow needs a face lift and new leather anyway, so I might could take a file to the sight window and bring it in maybe a 1/16th on each side and refinish the whole thing. Plenty of wood there in both width and back to belly for a 40lb bow. 60 @ 28 here. I'll shoot 40 when I'm old. As for now ill shoot heavy while I can Too true-shoot 60@ 28 while young and miss lots!! I also have my 21 inch Dalaa with Winex long limbs for my back up bow. It's 40 to 42 and a 66 inch bow. G.T. 1535s with 175grn Ace broadheads. Rich Emery Stikbow 45@30in. 500 Gold Tip blems with 125 MA2 and 125gr steel adapter. Fun little bow. Awesome information guys I’m surprised of all the guys shooting 500 spines out of 40 pound bows I’ll have to mess around when my new bow gets here! What's your draw length and desired finished arrow length? What's the actual poundage at your draw length? What kind of string will it have? How many GPP would you like to shoot (or what finished arrow weight are you looking for) and using what weight point? Will you be shooting off the shelf, or using an elevated rest and perhaps a Berger button? Answer those 6-8 questions and there will SOMEBODY around here who can tell you just about exactly what you need. Why mess around when you can start off pretty near dead nuts? 42# @28" Bob Gordon warfed Rambo, 29" 600 spine ST Epics, 125gr Magnus broadheads, 351grs total arrow weight. Austin, please note that 500s work for me in my 42#@28 Whip w my 26.5" draw because i am using 34" arrows. A 30" 600 tunes very well also out of this bow. I only moved up to 500s because i wanted a very long arrow. That being said, too many variables in equipment and shooter to accurately predict what will work for you. Like you said, youll just have to try some different combos to find what works. Good luck w your set up. I have hunted with a 40# Bear Montana for the last 5 years. First few years I shot 29” 1816 aluminums, with 125g Magnus Stinger on the front. But the last couple years I have been shooting full length 600 spine goldtips, with 100 grain brass insert and 125g Stingers. Weight on the 1816’s is 440 grains, and 460 grains for the carbons. Should also note that I only have a 27” draw length...so my bow is about 38#. 40lbs border hex 7.5 with 400 spine and 200gr points. Mature doe 42# Whip, beman 600 mfx, 156 grain grizzly single bevel. Pass through. My main hunting bows are 50# but I also have a 40# Samick Sage and Toelke Super D that I wouldn't hesitate to use on whitetail for a second. One year when my lightest bow was a 64@26 Schulz, all of my other bows were near or over 90 pounds, I tore a tricep muscle doing my 24 a day palm out pull ups and military lifts. I shot a 160 pound deer with a 37 pound Hill longbow and got a pass through at 18 yards with a 5/16 Acme cedar pushing a dremel sharpened 140 grain Hill broadhead. I never hunted with a heavy bow again after that. I have lost count of how many deer that I helped drag out that have been shot with lighter bows. I used have feelings about people using lighter bows, I was wrong. We ain't hunting cape buffalo in Iowa. Back in the 80s a guy in ohio who had just had cancer that had spread to his lymph nodes and had a radical mastectomy decided he would still bowhunt. He normally shot 80 lbs. He began with 20lbs and by deer season he bought a 40lb howatt hunter and had built into it. He killed a buck that scored 201 and weighed well over 200 lbs with that 40lb hunter. To this day his buck is tied with 1 other for the largest typical buck ever killed with a bow in ohio. So yes 40 is plenty even for big bucks if you place your shot. Btw if you choose to look it up his name is Bill Contras. I used 40# recurves. Now i have to shoot a c-pound. It's set at 40#. I shoot it instinctive. Had to switch because the arthritis in my pulling hand fingers. BOY, DO I MISS TRADITIONAL ARCHERY. 8^( I wish this on no one. 40 lb @ 29in black widow MA Goldtip 600 30in with Zwickey Deltas, complete passthru on 4x4 buck! I have issues with release finger injuries. I can shoot right handed again, but I limit the shooting frequency and the poundage to under 60 pounds. for long shooting sessions four five years, I only shot left handed. When I do long shooting session now, I change back and forth with duo shooter bows. Switching hands is not as difficult as some would have anyone believe, but I would suggest a light bow for shooting and hunting, 40 pounds will get it done. Using a bit of secondary aiming along with cheap sunglasses with my right eye covered and the plastic lens removed from the left eye, I was able to groove in the aiming very quickly. My first left hand bow was a 44 pound recurve drawn to my 27" recurve draw. I gave that bow to another trad hunter that got his right hand crushed, he did well with it on does. The 'numbers' thing is not a good way to decide what works and what don't. Some of us have experience with sub 50# bows, others don't. If you don't, then you can't speak intelligently to their effectiveness. Numbers written on a bow are just numbers. I have a 45# bow that I pull to 27" and get about 43# at my draw. My arrows are approximately 500 grains, and it will easily shoot through a whitetail deer. My last several kills were with that weight and two of the four were pass through shots. Perfect arrow flight is key for me, and being able to hit what you're shooting at. My bow's 40# at my 27" draw. I shoot woodies, 45/50 spine, and 125 grain 2 blades. I set up the arrows to be right about 46# dynamic spine, and like arrow weight around 10.5 GPP. Like George said, numbers alone don't tell the whole story. The bow I shot before this was 3 lbs. more draw, and liked a spine 3 lbs. less than my current one. "Who hunts with a 40 pound bow and what spine arrows and broad head combinations are you guys running?" I believe this was the original post, so in answer to that I would say I do. The Quinn is deadly with 1816's and the Pika and Stewart will bare shaft 2114's and put a smile on your face. 145 gr heads on the Quinn and 175 for the Stewart and Pika. And numbers are a very good place to start (you have to start somewhere) in bow specs and arrow specs. You tweak it from there. Spine for your setup comes from tuning, regardless of what we shoot. My Carrolls shoots 29" 2016 with 145 tips, or #8 Microflite with the same weight tips at 28". Many things go into "what arrow" when it comes to dynamics. What I use is pretty much irrelevant. But there...I told you anyway. ;) By the way, I can also shoot 50# spine wood arrows from that same bow at 29" and 125 heads. My bow is inside center by about 1/8th inch so it's rather generous with spine use. Yes sir George, and that is why someone invested a pile of time and money in making all those nice charts that a lot of us refer to for a starting point. That really helps for most, especially the beginning archer, as to where you begin. Modified Jerbowdan Whip 62" 42@28. I pull it back to 30.5 so she's 49#. I use Wapiti tapered POC,31" with old Simmons Interceptors total weight is at 548-552 grn. This has been my elk/all-around set up for 2 years now and work's great. Those Wapiti’s are very nice shafts and the come in 33” ! That rig sounds solid. I’ll be hunting with one of the following or maybe all of them at some point. 34# Wing Red Wing Hunter, 35# Browning Medallion, 37# Bear takedown, 40# Abbott Pacific Yew longbow or 40# Pronghorn takedown longbow. They all use the same wood arrows, 45-51# spine and 500-520 grains. I draw 27- 27 1/2”. Oh forgot my heavyweight bow, a 45# Sunset Hill longbow. All weights listed are at 28”. Shoot 40# Uukhas-100 grain fields tips and broad heads with 400 spine Gold Tip Ultralites. Yes of course I know this impossible,but not for me. This...41#@30. I can hold it as long as some confound shooters. I've been out hunting and pretty late on this thread and haven't read the whole thing. I went straight to George to see what he said. THe numbers are bogus way of judging. Case in point, I use to shoot a 50 at 29 inch longbow. Due to spine/shoulder issues I dropped down to a bow that drew 39 pounds. The arrow I tuned it with gave me 6 foot/pounds MORE energy than the 50 pound bow. Use the right numbers and they're not bogus---draw weight is just that-- the amount of physical effort it takes to draw the bow. More worthwhile comparisons would come from arrow weight and speed. ie-- how many are hunting w arrows 400 grains going less than 160 fps. Although i realize not everyone has ready access to a reliable chronograph. An efficient 40# bow may very well push an arrow of the same weight much faster than a poorly designed 50# bow. I still enjoy these threads as i enjoy hearing what others are being successful with. Ok I know this thread was for 40 # bow but I have been shooting my 46# Whippen Stick longbow with CE150, 145 field tips. At a local bow shoot they had a chronograph. It indicated steerage 180 fps. I was surprised. My other longbow chronograph at 186 fps with a GT400. The Whippen Stick is a lot easier to shoot. I think I will use the Whippen Stick this season. Just my 2 cents. These critters taken with 41# and 44#'s. Full length 500.s with 145 Grizzly's in the 41# and full length 400's with 175 grain Grizzly's in the 44#. Depending on the bow (40-45lbs) I use .600 or .500 spine arrows with 170 grains up front. Arrow weight is in the 9-10 gpp range. My wife shot a nice sized bear with a 40 # longbow and got a complete pass through . 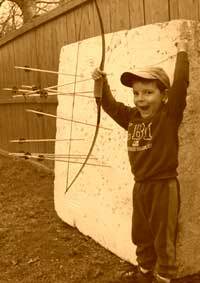 In the early 80s my son had one of those cheap Korean recurves at about 40#s at his draw, I watched him lean over in his tree stand and shoot a doe right behind the front shoulder, he used a 2 blade Zwickey for a head and the arrow just fell out, he hit a rib no penetration at all, not enough horse power. We got rid of that piece of junk and ordered him a custom bow . Different bows can make a difference some are faster than others at 40 #ish weight some way faster with the same arrows . FWIW, Larry has killed a few hundred bears and who knows what-all else with a #35 "kids' bow" w/ no issues. Probably wasn't a fluke. Reasonably, the lighter the rig, the more critical your tune and broadhead selection become. If you're concerned, you can go high FOC with a light, stiff shaft and enough head-weight to make it bend properly.